Tangerine Dream (an avant-garde German band founded by Edgar Froese during the pivotal era of the late 1960s) started out primarily influenced by what could be considered the first space rock tracks (such as "Set the Controls for the Heart of the Sun" & "A Saucerful of Secrets" from Pink Floyd) yet improvised and experimented to such a degree of depth that they traveled far beyond Floyd. In fact, the genre tag "space rock" does not apply to Tangerine Dream (except their one-off early single.) For a more accurate encapsulation of the "space rock" sound, see the appended shortlist at the end of the review. * Tangerine Dream were truly "kosmische musik" with no peers, save for Popol Vuh, whose own mystical re-evaluation of music also began with electronic experimentation, courtesy of the revolutionary Moog. 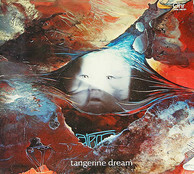 Tangerine Dream became the most influential electronic musicians due to their breakthrough album Phaedra (which is still a watermark in the history of electronic music and maybe the definitive ambient album.) While TD's near perfect meshing of new, more rhythmic sequencer technology with the diverse tonal color palette of the Moog and Mellotron in Phaedra and its companion piece Rubycon was the technical pinnacle of the band's career (perhaps their most accomplished albums), the band's earlier years are more radical and innovative. Before signing to a major record company (British magnate Richard Branson's Virgin) and releasing Phaedra (1974), TD had already sustained a substantial cult following from three previous albums on Rolf Ulrich-Kaiser's native Ohr label. Alpha Centauri (1971) used the space rock template from Saucerful of Secrets (and removed the rock) to stretch out into interstellar reveries of grandiose religious fervor using a battery of electronic gadgets (VCS3 synthesizers, Farfisa organ, and even coffee machines! ), as well as fluttering flutes and zigzagging zithers. The LP was "dedicated to all people who feel obliged to space." It is a voyage to the nearest star system in the Milky Way galaxy. Zeit (1972) slowed things down much further. A cello quartet and Moog (contributed by Florian Fricke of Popol Vuh) established the dark matter minimalism of the opening track and the rest of this monolithic and gloomy double album wanders through droning passages of emptiness as the origins and formation of the universe are charted in architectural lattices of a “largo in four movements.” It's the band at their most abstract and austere, their most difficult album. While Alpha Centauri and Zeit floated through starry and sinister spacescapes, the later triumvirate of Phaedra, Rubycon, and Stratosfear ascended and descended through airy and aquatic dreamscapes. The latter albums let more light shine through in the midst of the mystery (Ligeti-inspired chorales, meditative and beautiful trances), whereas the former albums contain a stark and bleak awe. It's a comparison between obsidian sheen and opal luminescence, between the enigmatic and the ethereal. Often, unfortunately, ignored in comparison in the band’s discography is their transitional album Atem. Released in March 1973, Atem is TD's most adventurous and exhilarating listening experience. It was nominated Album of the Year by pioneering DJ John Peel. It’s neither a trip to outer space (Alpha Centauri, Zeit) nor inner space (Phaedra, Rubycon, Stratosfear)—it takes place on planet Earth. It traces the origins of human life in reverse. The title track is TD’s most powerful moment, rendered in widescreen cinematic grandeur. "Atem" ("Breath") opens the LP with the submerged sound of breathing coalescing into the desert wind which drifts across the land as dramatic, ominous Mellotrons and thunderous tribal tom-toms set the scene of an ancient ritual atop a ziggurat. The ritual appears to be a blood sacrifice to the gods as the Mellotrons swell in surging spectacle and the percussion becomes more and more intense. The high priest raises the sacerdotal dagger high above his head and plunges it over and over into the chest of the victim. He tears out the heart and, with hands cupped, offers it to the glowing sun burning with blinding light as the heat mirages ripple from the sands. SUDDENLY--the ceremony is over. Thick gray clouds shroud the temple and an eclipse darkens the sun. Everyone's face is frozen in silent gasps, mouths outstretched in fear, as the island of Atlantis splits apart and collapses, sinking, into the ocean. The muted void is haunted by humming, buzzing, and whirring VCS3 synthesizers, the sound of silver metallic UFOs spinning through the skies surveying the aftermath of the destruction. The resounding rhythm of an echo down an endless corridor. It is a heartbeat. There are survivors. Synths oscillate, the lazer lights of the gleaming mothership, as it announces its arrival and slowly hovers to its descent. The aliens mate with the remaining women. The resounding rhythm of an echo down an endless corridor. It is a heartbeat. It is the embryo of the first Homo sapiens. "Fauni-Gena" is the primitive ancestor lost in the lush and bewildering rainforest. Froese's Mellotron is misty and mysterious, stepping stone notes which are the wide-eyed wonder and hesitant probing of the primeval human being of its environment. Birds call, fly, and swoop from every corner of the canopy (field recordings from a German zoo) as a dewy flute tone from the Mellotron wafts in the distance. The search grows frantic and restless as a bassline pulse disappears, re-emerges, and disappears once more into the jungle. The primitive has found plants of every variety, including the magic mushroom. "Circulation of Events" is even more veiled and obscure as cryptic, creepy, and deeply mystical VCS3, organ, and Mellotron all blur and spiral together into a vortex within the spatial chambers of a cave. The ancestor sees symbols everywhere and in everything. The symbols are carved, drawn, and painted onto the walls of the underground cavern. "Wahn" disturbs this arcane standstill as a bellowing babel, bizarre apelike utterances, (the first building blocks of human language) are reverbed and boomeranged back and forth. It is the beginning of human community. Tribal drum beats and magisterial Mellotron usher the dancing shadows by the campfires onward towards their future evolution. Thus TD's weirdest and wildest album ends where it started.